Home > News > Careers > Welcome Evie and Andrew! Evie Curl BA (Hons) and Andrew Stirling-Brown join our expanding Leominster Post-Ex Team as Post-Excavation & Archiving Assistants. 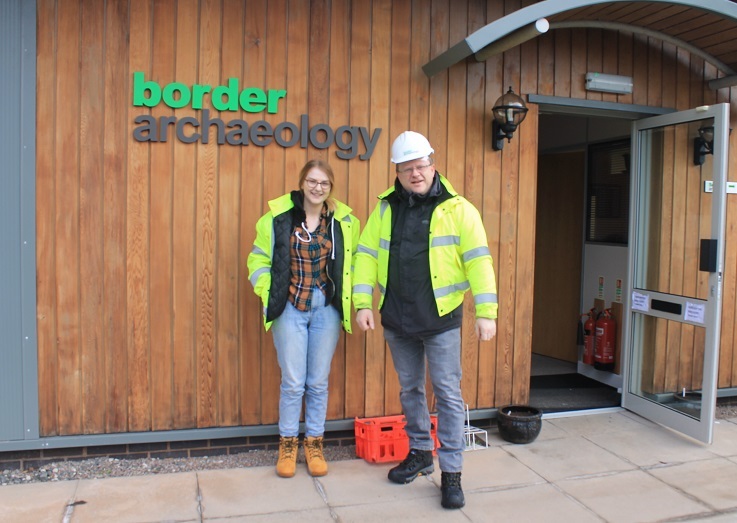 Both are currently enjoying their Induction programme at Border, Evie and Andrew were quick to swop their protective gloves for a pair of hard boots! “To have the chance to reveal a find in situ is thrilling” confirmed Andrew. Evie worked for the Portable Antiquity Scheme and recently did a talk in Cardiff about the Shropshire Piano Hoard. Andrew has recently co-published “The Story of Dilwyn” which has just been launched by Logaston Press.